Transform any room into a starry night sky. addition to the award winning Sleep Sheep & Friends Collection. Twilight Ladybug, along with Twilight Turtle, is the only plush constellation nightlight ever created, that gently transforms nurseries and bedrooms into a starry night sky that comforts and calms children and adults alike. From within her plastic shell, Twilight Ladybug projects a complete starry night sky onto the walls and ceiling of any room. 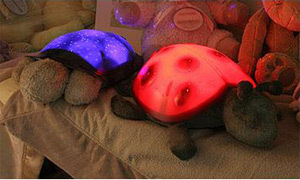 Twilight Ladybug comes with three soothing color options emerald green, sapphire blue, and ruby red, each illuminating different brightness levels to create magical, tranquil environments that are ideal for helping children of all ages fall asleep easier. Twilight Ladybug is more than just a soothing bedtime companion, she is also an interactive and educational toy. Within the star pattern are actual star constellations. Parents can sit with their children and identify these major constellations using the wonderfully illustrated Twilight Ladybug Star Guide. The life size Twilight Ladybug is 14 inches head to tail and stands 5.5 inches high. Full night sky projection on ceiling and walls. 3 color options: Sapphire Blue, Emerald Green & Ruby Red. Shell illuminates for a calming nightlight effect. �Twilight Ladybug Star Guide� to help find constellations. Includes Twilight Ladybug story and adoption certificate. Includes a battery saving 45 min. time-out function. BONUS - Includes 3 AAA batteries. Company Name: Fangzheng Craft & Gift Co., Ltd.